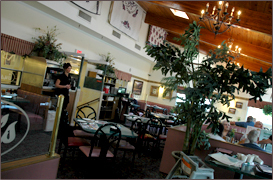 Gus’s Keystone restaurant opened in 2000 by Gus Kourgelis to serve the residents and guests of Mt. Joy, Pennsylvania with great food and friendly service. 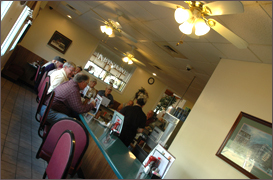 Gus’s is the place to be for breakfast, lunch or dinner any day of the week! Gus began his career in the restaurant business in 1970 at the age of 16, starting modestly by washing dishes in a restaurant owned by a family friend. However, Gus’s love of providing those he cares about with great food and great service has always been a part of his life and culture. Gus followed his family from Chios, Greece to Lancaster in the United States in 1969 at the age of 15. Family gatherings have always revolved around the preparation and serving of quality meals, but Gus truly learned his love of cooking and his expertise at food preparation from his father. In 1982, Gus proudly opened the Land and Sea restaurant with his father and brother-in-law. He credits his “all hands on deck” approach to business directly to his father. Even today you can find Gus applying this approach in the restaurant. Whether stepping in to help with the cooking or cleaning, every task is conducted with great attention to detail and pride. Gus’s Keystone is truly a family business. To Gus, the staff is an extended part of his family. Many have been with the restaurant for since its opening, including the chef who has been with Gus for over 17 years. And often you can find Gus’s children on the premises, daughters Lia and Lem taking shifts with the wait staff, sister Maria welcoming guests, and most recently, Gus’ son Yianis has stepped up to become an integral part of running the restaurant. To Gus, the most important part of the restaurant are the customers, many of which Gus knows by name. You can often find Gus sitting with his regulars discussing the latest news and talking about life and family. The menu at Gus’s Keystone is extensive. Along with specialty cakes and pies, over 5,000 dinner rolls are baked on-site weekly. Fresh seafood and local produce are brought in regularly and the menu is chock -full of Pennsylvania Dutch inspired comfort food, Greek cuisine and seasonal specialty dishes. Any visitor is sure to find something to their taste. 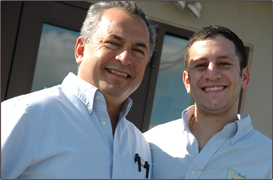 Next time you are in the Mount Joy area, be sure to stop by, say hello to Gus and Yianis, and enjoy a wonderful meal! 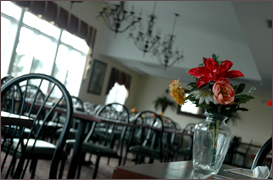 Gus’s offers use of their banquet facility for functions up to 100 guests, Monday through Thursday only. Perfect for bridal showers, rehearsal dinners, small weddings, professional meetings and much, much more… consider Gus’ for your next event. Call Gus at 717-653-2140 for more information and to plan a customized menu for your event.